Endemic to the African tropics, the Ebola virus has killed thousands in recent years, putting the World Health Organization and major donor countries in the limelight as they’ve grappled with how to respond to outbreaks. First identified in 1976 in what is now the Democratic Republic of Congo, or DRC, the Ebola virus has resurfaced in recent years, claiming thousands of lives and putting local and global health systems to the test. The disease was mostly confined to small outbreaks in remote settings until 2014, when it hit urban areas in several West African countries and traveled as far as the United States. The historic epidemic killed 11,316 people, more than ten times the number from all previous outbreaks combined. The World Health Organization (WHO), criticized for its slow response to the crisis, has since worked with other international institutions and donors to boost their ability to stem such outbreaks. But the agency and its response partners have continued to struggle to control the disease despite the use of an experimental vaccine, as a new outbreak in the DRC in 2018 grew to become the second largest ever. Ebola, formerly called the Ebola hemorrhagic fever, is a rare, severe illness that attacks its victims’ immune systems, causing extreme fluid loss and often death. The disease disrupts blood-clotting, which can lead to internal and external bleeding. Shortly after infection, victims typically experience fever, muscle pain, headache, and sore throat, followed by vomiting, diarrhea, rash, and bleeding. Symptoms appear, on average, eight to ten days after contact with the virus. Fatalities, most often caused by severe dehydration, can occur within a week after initial symptoms. People contract the disease from contact with animals—usually bats but sometimes primates—or from cooking or eating contaminated foods. Human carriers can then transmit Ebola to others through their bodily fluids. Their bodies remain infectious after death. Unlike the common flu and the measles, which are airborne, Ebola is relatively difficult to contract. An outbreak is considered “out of control” once it reaches the threshold where each victim is infecting two others. The virus is named after the Ebola River, in northern DRC, where it was first identified. 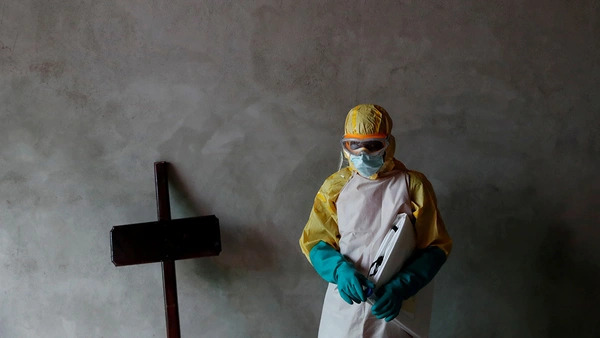 Home to nine outbreaks since the disease’s discovery, the DRC is a “reservoir for the virus,” medical expert Peter Piot told Scientific American. The largest outbreak, however, occurred in West Africa from 2014 to 2016, killing more than eleven thousand people, the vast majority of whom lived in Guinea, Liberia, and Sierra Leone. Prior to that, the largest outbreak was in Uganda in 2000, in which 425 people were infected and 224 died. Most other outbreaks have occurred in Gabon, the Republic of Congo, and South Sudan, though international travel has led to cases of Ebola in Western countries, including the United States. Cases of the disease have more often occurred in isolated areas, providing a sort of natural quarantine to keep Ebola from spreading. But some experts say deforestation across parts of Africa’s tropics, which is putting more humans into contact with animals, could contribute to more outbreaks. Health-care workers typically place the sick under quarantine to keep the virus away from the general population during its twenty-one-day incubation period. Using protective equipment, they screen potential Ebola carriers for symptoms and travel history. People in high-transmission countries are generally told, as part of public awareness campaigns, to avoid physical contact, such as hugs and handshakes. Families are also encouraged to bring sick relatives into clinics instead of caring for them at home. Because the corpses of Ebola victims can be even more infectious than living victims, health workers warn against traditional burials, which include washing and touching the dead. Other measures suggested to prevent the disease from spreading have been more controversial: Some U.S. politicians have called for travel bans on countries experiencing outbreaks. However, many experts say travel restrictions could be counterproductive. Several cases of Ebola were diagnosed in the United States during the 2014–2016 outbreak, but President Barack Obama decided against imposing a U.S. travel ban on West African states, saying that such a policy could hinder the transport of health workers and supplies and prompt people to avoid screening. Is there an Ebola vaccine? There is currently no licensed vaccine for the disease, but experimental treatments have undergone clinical trials. In May 2018, health workers in the DRC began using an experimental vaccine developed by Merck, the U.S. pharmaceutical firm, which appeared to be effective in tests during the West African outbreak. Health workers routinely use ring vaccination—vaccinating primary and secondary contacts of infected persons—to contain the disease. Alternative treatments include rehydration and plasma infusions from Ebola survivors, who are believed to possess antibodies to the disease. Why was the 2014 outbreak in West Africa so deadly? Unlike past outbreaks, which were generally confined to remote areas in Central Africa, this epidemic had spread to several communities before being identified as Ebola. By the time the first diagnosis was made, in early March 2014, the virus had already struck multiple villages in Guinea and cases were suspected in Liberia and Sierra Leone. 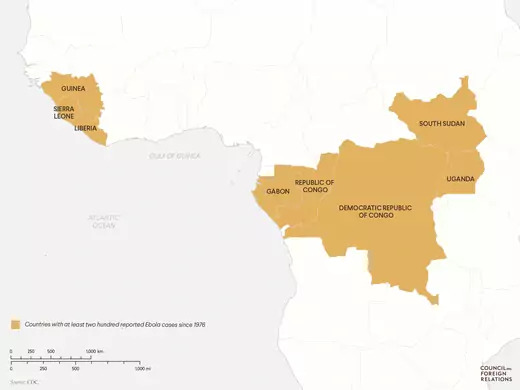 Many experts have noted that the breadth of the outbreak was in part a function of wider road access between communities in Guinea and across its borders, including into the three countries’ capitals, where the disease spread rapidly. By the end of 2015, more than 28,000 people across eight countries were infected; more than 11,300 people died. Ebola is more a symptom of a weak health-care system than anything else. The disease’s ability to spread was largely due to the stricken countries’ poor health infrastructure, experts say. Prior to the Ebola outbreak, there had only been fifty doctors in all of Liberia, a little more than one per hundred thousand (there are more than two hundred times that proportion in the United States). Physician and public-health expert Paul Farmer has written that “Ebola is more a symptom of a weak health-care system than anything else,” adding that with proper supplies and trained personnel, the disease could have a 90 percent cure rate. Moreover, many health officials have criticized the WHO, hobbled by recent budget cuts, for not declaring an international public health emergency until August 2014. “If the response had been much earlier, in the spring or early summer, there wouldn’t have been the need for nearly as much money and not nearly as many people would have been infected,” Georgetown University Medical Center’s Daniel Lucey, who cared for hundreds of patients in Liberia and Sierra Leone during the epidemic, told CFR. Have there been other serious outbreaks since 2014? The DRC has experienced several outbreaks since the West African crisis. The first, in mid-2017, which killed four people, was contained in a relatively remote area in the northern Bas-Uele Province and declared over by early July. A year later, the disease returned, this time in the country’s northwest and soon after in its northeastern North Kivu Province. By late 2018, the outbreak in North Kivu had become the second largest in history [PDF], with a death toll of more than 350. (The northwest outbreak was declared over within three months.) 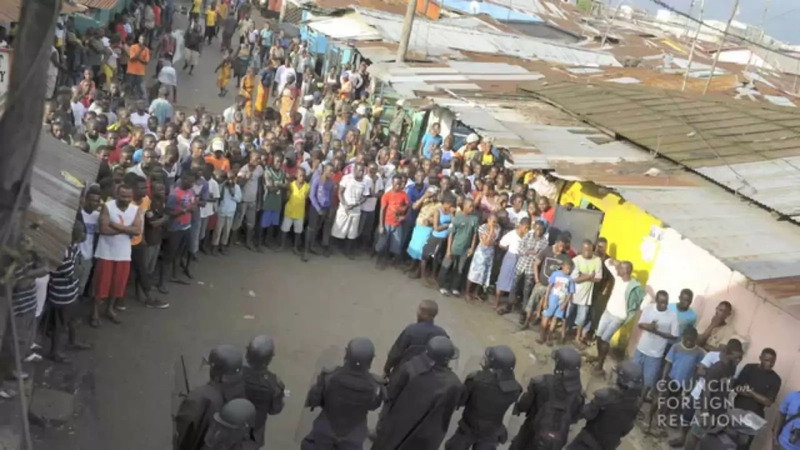 Violence related to the December 30 presidential election raised concerns about the spread of the disease after health workers were forced to halt efforts in some towns and hundreds of Congolese fled to neighboring countries. The government had postponed voting in several cities, citing the outbreak and insecurity. What are the economic consequences of outbreaks? Large Ebola outbreaks can devastate economies for extended periods. For instance, the World Bank estimated gross domestic product losses totaling $2.8 billion [PDF] for Guinea, Liberia, and Sierra Leone from 2014 into 2016. Steep drops in commodity prices during this period compounded the economic damage, the bank said. Outbreaks can cripple governments’ capacity [PDF] to provide social services, including health care and education, as well as force businesses to close and farms to halt production. For instance, schools in the three worst hit countries during the 2014–16 outbreak were closed for months, affecting an estimated five million children. How does the world respond to outbreaks? Outbreak countries usually look foremost to the WHO but also to other UN agencies, nongovernmental organizations such as Doctors Without Borders, and foreign governments to assist with relief efforts. In 2005, nearly two hundred nations pledged to report health emergencies that could require an international response, including Ebola outbreaks, although there is no enforcement mechanism. Many analysts say the WHO and other bodies have been slow to respond in past crises, with the 2014–15 outbreak being a flashpoint for such criticism. In late 2014, donor countries led by the United States and the United Kingdom ramped up their financial commitments to combating Ebola. Over the next year, the United States, World Bank, and others pledged several billion dollars [PDF] for military, medical, and logistical support. Additionally, countries at a UN conference on post-Ebola recovery pledged an estimated $5.2 billion [PDF] for a wide array of projects, from new water and sanitation infrastructure to social programs for women and children. In response to the 2018 outbreak, the World Bank, for the first time, disbursed a grant—some $12 million—from a pandemic emergency fund it launched with Germany, Japan, and the WHO, as well as some private firms. The new mechanism is intended to make funding available before an outbreak reaches the point of international crisis. The WHO outlines the basic facts of Ebola. The New York Times traces the path of the 2014–2016 West African outbreak. Former CFR Senior Fellow Laurie Garrett examines what global health leaders can learn from the Ebola outbreak. Njala University’s Paul Richards argues in his 2016 book, Ebola: How a People’s Science Helped End an Epidemic, that the international response to the West African outbreak should have provided greater support to local community initiatives. Scientific American asks why the DRC has been home to so many Ebola outbreaks.